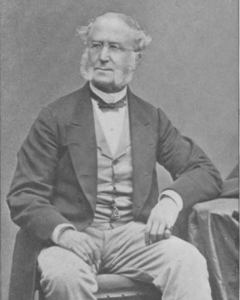 Growing up the privileged son of the President of Harvard University did not prevent Edmund Quincy (1808-1877) from becoming a tireless and devoted advocate for abolitionism. A graduate of Phillips Academy and Harvard University, Quincy’s start as a lawyer was interrupted by the 1837 death of abolitionist Elijah Lovejoy at the hands of a pro-slavery mob in Illinois. Inspired by this event, Edmund Quincy became one of the leading abolitionists in the nation. In addition to writing for several abolitionist periodicals and journals, Quincy frequently appeared as an editor of William Lloyd Garrison’s “The Liberator,” served as the correspondence secretary of the Massachusetts Anti-Slavery Society from 1844-1853, was Vice-President of the American Anti-Slavery Society from 1856-1859 and, while a Massachusetts Justice of the Peace, refused to return fugitive slaves to their owners . A progressive reformer in his day, in addition to opposing slavery, Quincy believed passionately in non-violent resistance. Quincy’s influence upon leading abolitionists, his unflagging and passionate criticism of those in the North who failed to oppose slavery (including many from his own class and church) and his many writings combined to forever change American political thought.